This Comprehensive Purchase Agreement is designed for the acquisition of a large multi-tenant shopping center. 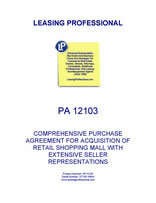 The Seller makes numerous representations concerning the property in a series of attachments to the agreement, which pertain to such items as the rent roll, existing tenant defaults and delinquencies, personal property, service contracts, governmental actions and investigations, condemnation actions, tax appeals and special assessments, tenant purchase options, unpaid tenant improvement allowances, major tenants, and the like. In many cases, the Seller is happy to be able to respond "None" in the attachment. 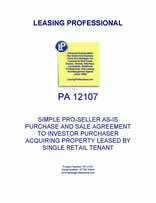 This simple real estate purchase agreement is pro-seller in orientation. It documents the sale of a property occupied by a single retail tenant from the owner of the property to an investor purchaser. The purchase price is to be paid in all cash at the closing. The property is sold on an as-is basis. A Tenant Estoppel Certificate and an Assignment of Lease are included as exhibits to the agreement.